We knew we would be passing thru the Hilton Head area on our way back to Florida and we had a few days to spare, so we contacted our friend Catherine with the Sun City Hilton Head Computer Club and asked if they were interested in us presenting a seminar on those dates. Their monthly meeting happened to fall on the day after we could arrive so, we scheduled our Cloud Computing Seminar for the full group, and then hands-on classes for our Smartphone/Tablet topics. We’re continually revising our topics and welcomed the chance to teach their members on both iPhone/iPads as well as Android phones and tablets. Within a few hours both classes were full, and there was a waiting list for the iPhone/iPad class – so we agreed to open another session. Here’s the Sun City Computer Group at our Cloud Computing Seminar. See the ‘Cloud’ over Jim’s head?! The club has a fully equipped computer lab where they teach their own classes all the time. I hope the residents here know just how lucky they are to have all these resources! An interesting part of teaching Smartphones and Tablets however, is that you don’t need any computer equipment! In fact, we had to push the keyboards out of the way so they had more desk space to work with their device and take notes in their workbooks. We did enjoy using all the teacher presentation equipment and we got in some practice using AppleTV to project the iPad. We could even enlist a helper to display her iPhone on the big screen while she was sitting at her seat in the back of the room. They also had a document camera we could use to project our phone complete with seeing our hands so they could see the touches involved. We made people pick a buddy and gave them exercises to do. This worked quite well, but we found that 3 hours just isn’t enough time, even though we’re just teaching basics! We were quite pleased with our workbooks. They kept us on track and gave students a reference as well as specific exercises to complete. We might even figure out a way to provide the books so the club could teach our class themselves. Cool idea don’t ya think? Wouldn’t you know that a new version of the iPhone/iPad operating system was released the day before our first class! The books will have to be modified … again. That’s why we like producing them ourselves … print on demand! We change them before every class! 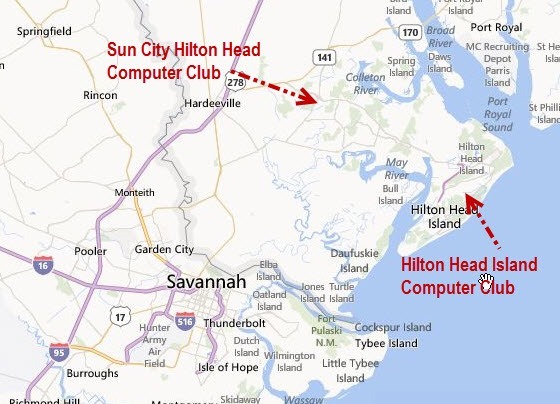 When the Hilton Head Island Computer Club heard we would be in the area, they asked for a seminar too. Sure! When we were finished with the classes at Sun City, we stayed one more day and were able to present the same Cloud Computing seminar to the Island group. They had new facilities since we were there last. A nice big room and a Smart TV for display purposes. And a fast, fiber-optic connection to the Internet! We still brought our own cloud! If you look at our calendar and see that we may be coming your way, please contact us to present to your group. We’ll give you all the details. You’ll be surprised at how inexpensive we are – sometimes even free! Published by MrsGeek, in Blog. Tagged with Computer Clubs, Geeks on Tour Seminars, Hilton Head Island, Sun City Hilton Head.